Kalaupapa National Historical Park (NHP) lies on a peninsula at the bottom of sheer cliffs, with the Pacific Ocean bordering three sides, and is situated along the northern coast of Molokai. It is included in Kalawao County, which has a long-standing restriction against entry for anyone under the age of 16. This creates a hurdle for the park to overcome in order to satisfy the Every Kid in a Park initiative as well as include young students in our centennial celebrations. How could we engage local Molokai keiki (children) in this vivid and powerful story of Kalaupapa if they are not allowed access to this place? Well, you bring the park to the people! 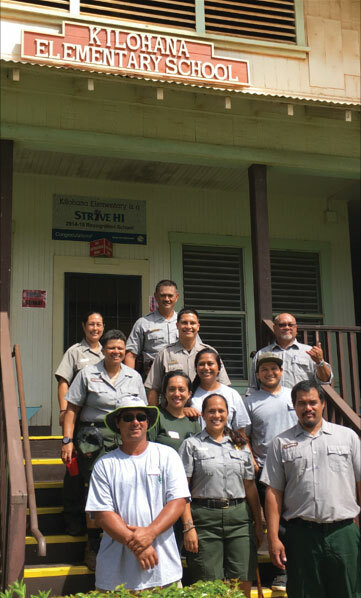 In September, Kalaupapa NHP staff packed up their gear – everything from ranger uniforms and archaeology tools, to plant and animal samples and displays. Over three days, they engaged over 240 students in hands-on activities, demonstrations, a hike and a field trip to help bring the Kalaupapa story alive and to introduce students to the many kinds of careers available in their backyard. Each division sent representatives who visited three of the four elementary schools on the island sharing who they are and what they do. Many students were surprised to recognize some of the park staff as relatives and neighbors, since they never get to see them in uniform. They learned about natural and cultural resources and the many ways we care for them. They learned about law enforcement and what it is like to be a park ranger. They learned about the need for skilled tradesmen like electricians, carpenters and heavy equipment operators who help to keep the historic buildings and town in working order. 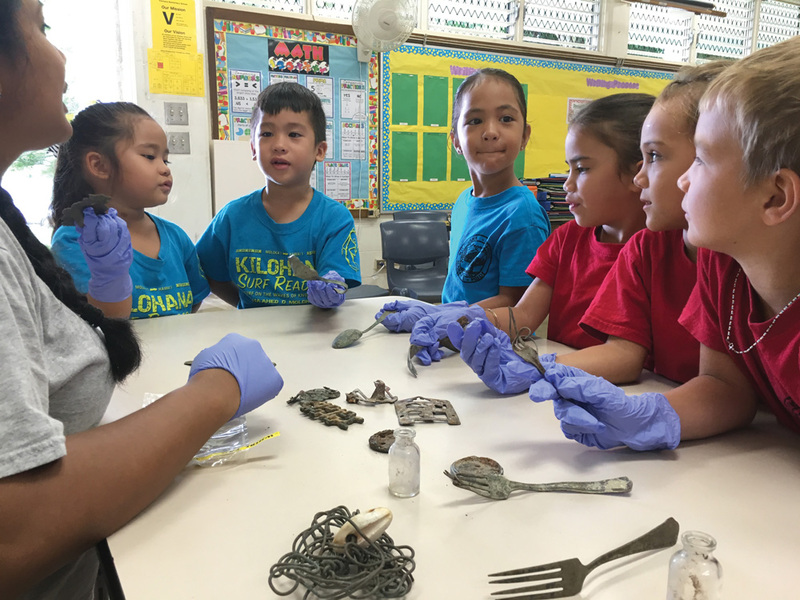 They learned about how fun it is to study history and archaeology, as well as marine science and botany. Some students could not believe that you can get paid to dive in the ocean daily and study the coral reefs, or go hiking in the mountains to install fences and protect the watershed. 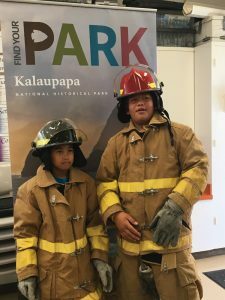 They were excited to learn that we have a museum and one day, when they are old enough, they can come and visit as a volunteer, work as an intern or even come and be a part of the National Park Service (NPS) staff! Anything is possible! The Kalaupapa NPS looks forward to making this an annual tradition. As long as the minimum age requirement of 16 years is in place, we will continue to bring the park to the people of Molokai. This educational outreach opportunity was funded by PHP, which also partially funds Mikiala Pescaia’s position at the park.